An earlier post made mention of a trip to Chaventry - well today was to be the day. Guest dogs are never left unattended so Smuu and Sisko were to come with me - however it was decided to take them to Lou's work place and leave them there. So, they were dropped off at Catesby (thats Catesby, NOT Cats By) en route to Chaventry, at Lou's office - not just any old office however but a converted stable block down a 1/2 mile drive in the middle of the countryside with sheep and long horn cattle in the surrounding fields. Oh yes and a couple of dogs; Dusty, a working cocky spaniel and Millie, a Jack Russel - a dog that makes Zinty look huge. I was only gone 40 minutes or so, the dogs spending their time with Lou - Smuu was delighted to see me and they hopped into the Jeep for the trip home. 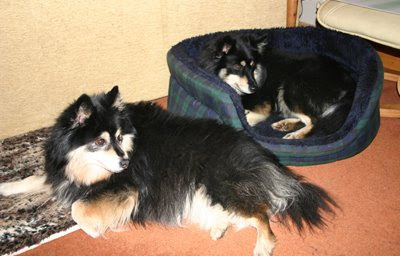 Kiva and Mylo were delighted to see them again and they all soon settled down for the afternoon and as I write Sisko is with us in the lounge - Smuu, next to her. Having now spent time with Smuu and Sisko, as well as some of Kiva's siblings, it amazes me to see their common traits, and differences. Sisko, when excited, shuffles her front paws in the same way as her dad, Tuukka. Sisko and Kiva are almost impossible to tell apart from the rear end. Sisko and Kiva both lift their paw when being stroked. Sisko, Kiva and Smuu all love their tummies to be tickled. Sisko and Zack (Kiva's brother) both share a look that they give, a sort of "OK what are we going to do now?" Sisko and Zack have the same nose. Kiva and Smuu both drool at the prospect of treats. Now if I could only get Sisko to show Mylo how NOT to bark I would indeed be in Lappy heaven. Memo to self; make sure you hoover the lounge floor, scrub the kitchen floor and wash Mylo's chair before taking cute dog pictures.